Home » Can Solar Panels be Damaged by Hail? Can My Solar Panel Get Damaged by Hailstones? Hailstorms are one the most unpleasant weather conditions in nature. Large ice blocks that fall from the sky causing damage to cars, windows, roofs and more. Hailstorms can damage property, but they also can injure or even kill people if the size of the block is too big. Therefore, they are a pressing matter and problem — especially in some regions of the US. Historical cities for hailstorms inside the U.S. are Denver, Dallas, Minneapolis, St. Louis, San Antonio, Oklahoma City, and Phoenix. This phenomenon can be predicted, and is important to pay attention to weather forecasts especially if you are located in the cities mentioned above. To check hailstorm forecasts across the US, you can go to hail.org. The most costly hailstorm in US history fell in Phoenix, Arizona back in 2010, when up to baseball-size ice-blocks fell off the sky leading to almost $2.8 billion losses attributed to damages. San Antonio also had a bad time in 2016 with hailstones of grapefruits size that cost around 1.4 billion dollars. And recently in 2017, Minneapolis had a really bad week with a consistent storm with heavy hail that fell in the Metropolitan region costing up to $2.5 billion. As you can see, hailstorms can be costly, and the solar panels located in these regions are exposed to falling hailstones that could strike upon them and break them, right? Since outdoor conditions for solar panels can be harsh, solar panel manufacturers must submit their modules to quality tests that ensure good performance of solar panels over a 25-year period, even at harsh environmental conditions. According to the jurisdiction and test center, several or different tests may be applied. However, in the US, the general references on this topic are the IEC 61215 and 61730 Standards, which specify the design qualification standards for module durability. Ultraviolet exposure using xenon lamps. Thermal Cycling (-40°C to 50°C, 50 cycles) in a climate chamber. Damp heat (1000 hours at 85°C with 90% relative humidity). Twist test for torque resistance. Pressure tests considering snow, wind and other mechanical loads. PID resistance related to electrical isolation. One of them is particularly interesting for our approach: the hail impact test. The purpose of this test is to precisely ensure that the glass of the solar panel will not crack against estimated or regular size hailstones. The typical hail test involves using 25 mm ice balls thrown at 23 m/s against the solar panel to 11 different spots. The path from the pneumatic cannon to the module can be modified as horizontal, vertical, or any other angle. Generally, the procedure involves storing these ice balls in a freezer at -10°C 5°C, then the solar panel is put in place to adapt it to cold temperature conditions of the climate room. An ice ball is measured in a balance to determine the mass with an accuracy of 2% along with another instrument to measure the speed of the ball with an accuracy of . Then, the ball is thrown and the module is checked with a slow-motion camera to verify if there was any detachment of the glass. Shot 1: Any corner of the module window, not more than 50 mm from the aluminum frame. Shot 2: An edge of the module, not more than 50 mm from the aluminum frame. Shots 3 and 4: Near an electrical joint and over the edges of cells. Shots 5 and 6: Over points of minimum spacing between cells. Shots 7 and 8: On module window, less than 12 mm from one of the points at which the module is fixed to the supporting structure. Shots 9 and 10: At points as farthest as possible from the points named above. Shot 11: Any other point that may seem sensible to hail impact. The hail test can also take into account other ice-ball masses and speeds that can guarantee the module to be more durable against hailstorms. In order to pass the test, the module must not show any evidence of visual defects after the impacts, the degradation of maximum power output cannot exceed 5% of the value measured before the test, and the insulation resistance must meet the same requirements as for the initial measurements. If you like to see how hail tests are performed, you can take a look at an outstanding hail test at 100 mph (twice as international standard requirements) from the new Tesla solar roof, and at quality tests on solar panels from SolarWorld. We have seen the tests that solar panels need to endure under lab test experiments, but how do they behave against real-world conditions? This question remained unanswered until 2017 when a massive hailstorm fell upon Denver, Colorado with hailstones up to 2.75 inches (similar to the size of a big egg). This hailstorm turned out to be the costliest in the State’s history and one of the costliest in US history, reaching $2.3 billion in damages. The National Renewable Energy Laboratory (NREL) has a Research Support Facility in Denver, Colorado with up to 3,168 solar panels installed between the roofs of the facility and the ground of the property, reaching to a 2.5 MW power plant. 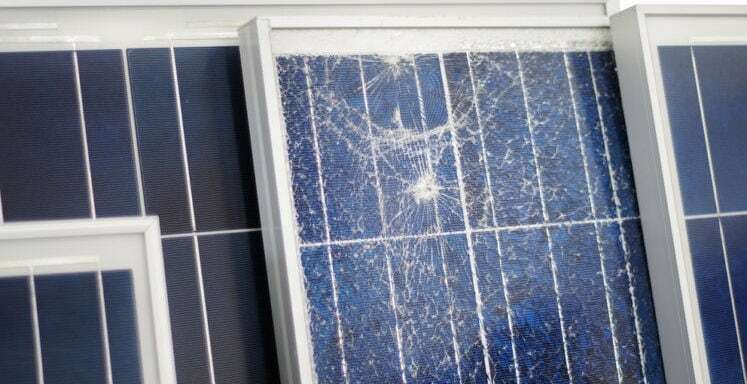 Amazingly, when the hailstorm passed, only a single solar module was damaged! A true real-world test of the endurance of solar panels against hailstones! The only damaged module of the installation was believed to be hit by several hailstones in the exact same spot. This created a network of micro-cracks in the glass from above 36 hits. Yes, solar panels could get damaged by hailstones, especially if their sizes are greater than 2 inches. However, solar panels are designed and tested to endure severe hailstorms and other weather conditions that will not allow solar panels to break easily. The greatest proof of that is the NREL solar power plant, therefore, it is highly improbable that your solar panel with be damaged in a hailstorm. In any case, in the unlikely event that you wake up in the morning and one solar panel’s glass is broken, don’t worry, your home insurance will cover that.